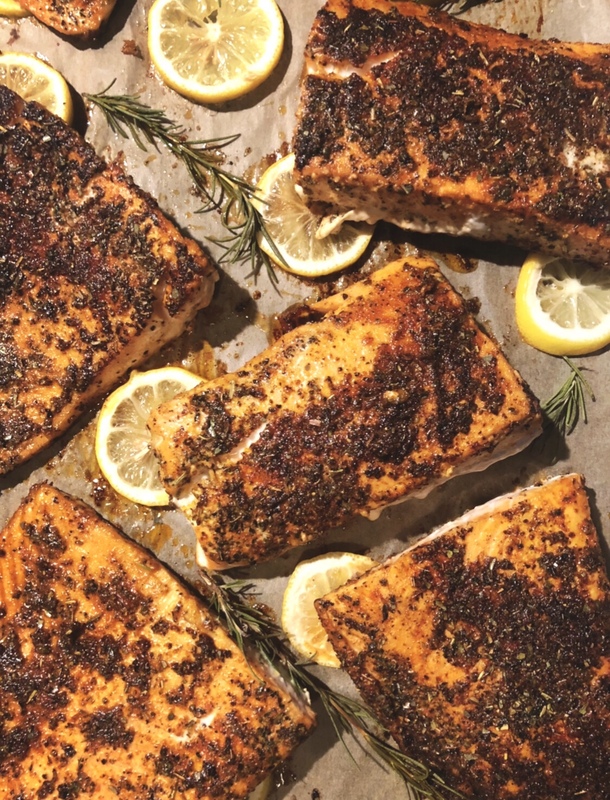 Amazing salmon isn’t difficult... as with anything, especially seafood, be sure to not overcook it— more on that later. Salmon takes on the taste of what it’s prepared with so if you want it to taste like something specific, cater it to your specific taste buds. 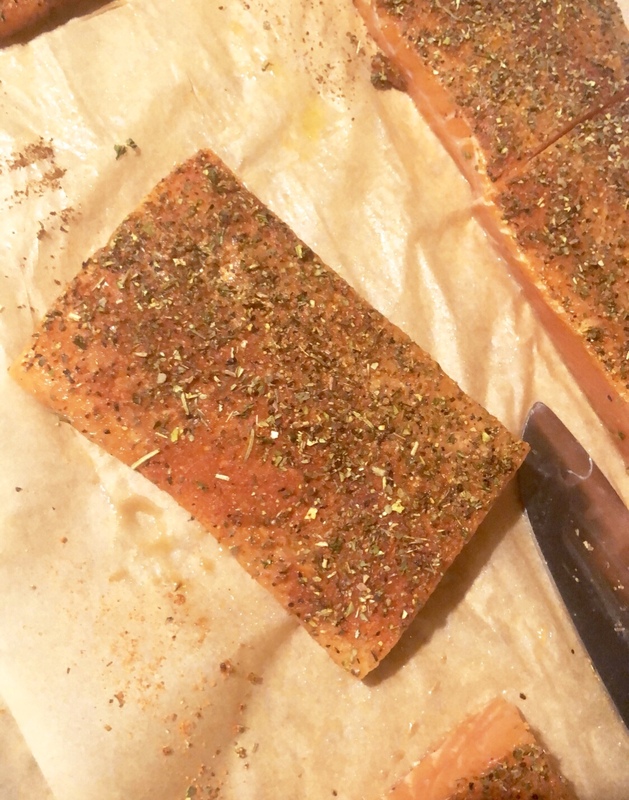 I prepared blackened salmon with these very simple ingredients and like everything else I prepare, I always marinate for at least four hours overnight. I started with half of a filet and cut it down after I marinated it to sear and eventually bake. Step 2: Apply the Original Seasoning as a rub on the entire filet... if the Original is too hot, stick with the Mild. Add Lemon & Herb Seasoning after you add the Original/Mild. Step 3: Preheat oven to 350 degrees and preheat a cast iron skillet to medium heat on your stove. Step 4: Slice lemons and pull some stems off your fresh Rosemary. Arrange a baking sheet with a line of parchment paper, lemons, and rosemary. Step 5: Cut salmon into smaller filets or to what you deem as one serving. Step 6: Sear cutlets in skillet for 2-3 minutes on each side depending on heat. You want to blacken the top but not overcook the salmon. Step 7: Once the sides are seared, place the salmon cuts on your baking sheet. Once they’ve all been seared, place in oven and cook at 350 degrees for no more than 7 minutes. 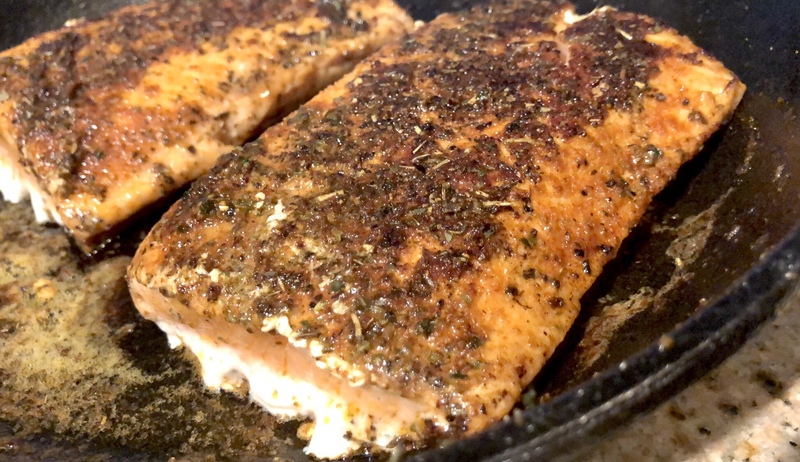 Simple and super quick, enjoy this salmon and all of it’s flavor. Pair with healthy sides or place atop a heap of leafy greens like I did and enjoy as a salad and prosper.